A Franklin native, Frank Hensley retired after 32 years of full time law enforcement. 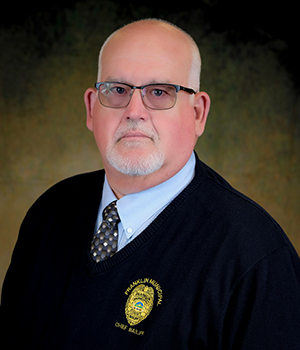 As Chief Bailiff, Frank is responsible for courthouse security and maintaining a safe work environment for the clerk's office, along with the safety of all persons appearing in court. In the courtroom Frank prepares and calls all cases in front of the Judge and talces their plea. Frank is also a sworn Probation Officer. He provides security for and assists with the intensive supervised probation docket, commonly referred to as Drug Court.